Drawing from its own collection and loans, the California Automobile Museum in Sacramento has more than 150 cars on display, from 1885 to recent models. Given that the museum’s members are referred to as “Gearheads,” it’s not surprising that the exhibit starts by teaching the mechanics of automobiles. Car engines and chassis are exposed with their parts color-coded to show how they work. The winding path through the museum allows views of both the front and back of most vehicles. Tableaus and murals are arranged chronologically to make visitors feel as if they’re back in the early age of motoring. Some cars are marked “Photo Opportunity,” so you can sit behind the wheel and snap a pic. Among the more unusual cars is a French 1924 Delage DI, with a curved wooden tail that wouldn’t look out of place on a vintage Chris-Craft boat. One of my favorites is a 1936 Hudson Essex Terraplane Six. Besides the cool name (“terraplane” is meant to evoke speed on land), it boasts a rare Griffin hood ornament that was only available for that model year. Another piece of automotive history is the 1941 Lincoln Town Car once owned by Henry Ford’s wife, Clara. No car collection in the Golden State would be complete without a few celebrities’ vehicles. When Jerry Brown was governor in the 1970s, he famously tried to cut costs by selecting his official state vehicle, a 1974 Plymouth, out of the motor pool. It sits next to his one-time girlfriend Linda Ronstadt’s black 1982 Porsche 911SC. (Both are shown below.) Perhaps they broke up because of their vastly different tastes in automobiles. 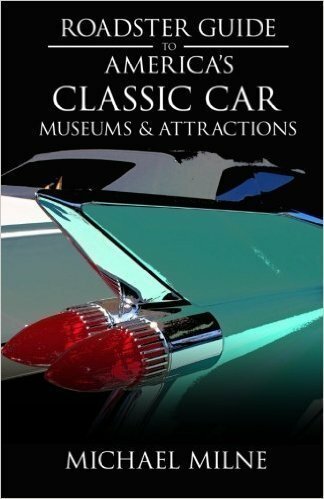 An unusual feature of the California Automobile Museum is that some of the cars are for sale. They’re taken on consignment and displayed off to the side. On any given visit, you might find a 1926 Ford Model T Touring ($14,500), a 1965 Mustang ($18,500) or, for those with deep pockets, a 1958 Porsche 356 ($139,000). After you get all fired up viewing vintage autos, it’s tempting to make an offer. In a cool twist, the museum also offers classes on driving and working on a Model A Ford. Hundreds of vintage issues of car magazines are for sale in the gift shop at reasonable prices. Number of vehicles: 150+ (displays are rotated frequently) Highlights: 1910 Peerless Model 27 Touring; 1936 Graham Supercharger Trunk Sedan; 1940 Lincoln Zephyr; 1949 DeSoto Carryall Sedan (the rear seat folded down to expand the space in the trunk). Location: 2200 Front Street, Sacramento, CA 95818. It’s tucked away in an old warehouse near the tourist area of Old Sacramento. Admission: $ Hours: Daily, 10 a.m. to 5 p.m. On the third Thursday of each month, they’re open until 9 p.m.